Some fighters enter the cage searching for blood. Strikeforce bantamweight queen Ronda Rousey (Pictured), on the other hand, will be going for the kill on Saturday … literally. Thankfully for Sarah Kaufman, California’s governing body will be there to protect her from death should their scrap head in that direction. 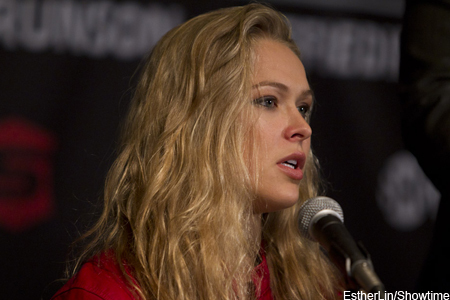 “I’ve trained harder for this fight than any other fight before,” Rousey stated during Thursday’s press conference. “She might not know it, but she should be thanking her lucky stars that MMA is properly regulated in California. Oddly, Rousey’s threats are directed towards a challenger she actually likes. Can you imagine the “Rowdy” one’s mindset when she took the hexagon against bitter rival Miesha Tate? But no hard feelings, Sarah. Rousey claims her vicious mentality doesn’t stem from her violent nature, but motivation her younger sibling provides her on a daily basis. Remember, Rousey also lambasted Kim Kardashian for being a bad influence on her sister. Kaufman will be fighting for her life, as well as the Strikeforce bantamweight crown, tomorrow night inside Valley View Casino Center in San Diego. Godspeed.